If you had a wishlist of wine legends to teach you about the red grape varieties of Piedmont: Dolcetto, Barbera, and, Nebbiolo, Roberto Voerzio would be right up there! I’ve been wanting to share the Piedmont Triology of Dolcetto, Barbera and Nebbiolo in a tasting pack for some time now. The perfect opportunity presented itself last week, with Voerzio’s trilogy of these wonderful varieties. With 3 wines from the one producer, all from impeccably tended vineyards, that have no overt oak character, and, have been wisely matured pre-bottling, we have a great opportunity to see each of the varieties express itself without interference from non-grape based influences, such as oak. The prices of his Cru Baroli and top-level Barbera are now out of reach for many. Today Roberto shares his thoughts on each of Piedmonts main red grape varieties in the form of his, entry level wines. Wines that would qualify as the top wines of many producers. All of the wines are from the La Morra sub-zone of Barolo. The Barbera from the Cerreto vineyard in front of the winery, and the Nebbiolo from two vineyards adjacent to Brunate. Vineyard pedigree at this level doesn’t get any better! I had the great pleasure of spending a few hours with Roberto Voerzio tasting through his entire range at the end of 2015. He speaks little English and my Italian is average. Together we spoke enough French to open a revealing dialogue. In many ways, he reminded me of Doc. from Yarra Yering. Take a look at the footage from this rare opportunity in the Wine Bites Mag – Roberto Voerzio Winemaker Session. It covers his 2011 Baroli and 2004 Barbera and Riserva. Roberto discusses the vineyards for each wine, his viticultural and winemaking philosophies, the controversies of modernist vs traditionalist winemaking in Barolo and much more. The Context – Red Grape Varieties of Piedmonte made by Roberto Voerzio. Tasting Order: This can be challenging, normally you’d taste by increasing fruit weight, and, increasing tannin. In the case of the Nebbiolo it will have the greatest amount of tannin, and, perhaps the least, apparent amount of fruit when placed next to a more immediately opulent Barbara. Putting it at each end of the spectrum! Examine a good one closely and you’ll realise, like Burgundy, it is playing that trick of placing wild, intense flavour behind a restrained, elegant facade. I’d recommend trying them in the following order: Dolcetto, Barbera, Nebbiolo. Flavours: Savoury dark fruits in the Dolcetto, vibrant red fruits in the Babera, earthy, perfumed, super complex flavours in the Nebbiolo. Acid: Highest in the Barbera, Nebbiolo in the middle, lowest in the Dolcetto. If you’re not sure what acid is, think of the difference between straight water and water with a squeeze of lemon juice in it. Tannins & Texture: Highest in the Nebbiolo, then the Dolcetto, most supple in the Barbera. Cellaring: The rules of thumb for cellaring differ for each of the varieties and producer depending on their sites, quality of fruit and winemaking methods. These recommendations are specific to the three wines presented in this offer. Each of Voerzio’s wines are drinking beautifully now, a testament to a skilled maker, one who clearly understands the interplay between oxygen, fruit, and, tannin! 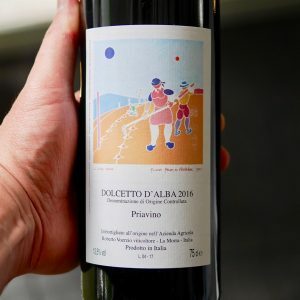 Dolcetto, best from 2nd half 2018 to 5 years. Barbera, now more fun after 3-5 years and will go 15 years. Voerzio’s top Babera will often go 20-30 years! Nebbiolo, now and over the next 10 years. management to avoid burning, but there were absolutely no fungal or disease risks. Harvest began early with the whites in late August to mid-September, and the wines showed superb sugars and acids, which will result in appealing wines of structure. 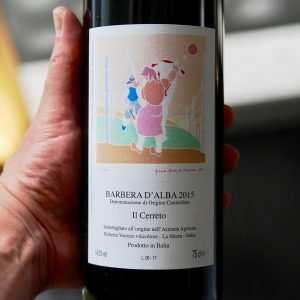 Barbera benefitted from the warmth in reducing total acidity and the cooler nights in August and September resulted in beautifully balanced and ripe wines. 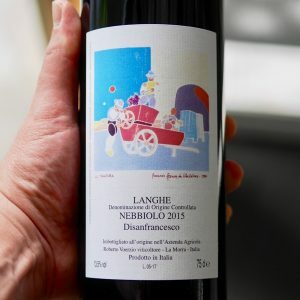 The nebbiolo ripened perfectly albeit earlier than in recent years, and the impressive tannins and excellent balance will ensure elegant, age-worthy wines of good structure. Everything was in place for a truly great vintage, one to remember like just a few others in history! *Wines are available for immediate dispatch, weather permitting. Watch out for offers from us giving you the opportunity to taste in Context and with Contrast. Vineyard Location: La Morra sub-zone of Barolo – The wine is sourced from a vineyard planted in the late 1990’s in front of the winery in Ceretto, La Morra. Fermentation is carried out in the traditional manner in small volume stainless steel vats, with an exposed cap with frequent pumping over and manual punching down of the cap. The fermentation temperature ranges from 30-32 degrees Celsius, duration around 15-20 days. The malo-lactic fermentation follows immediately. Maturation The wine was aged for 12 months in French oak tonneaux (500L) and botte (2,500L), 30% new, and was not filtered but rather clarified with egg white in the traditional and natural manner. The wine is further aged in bottle prior to release. Don’t get hung up the numbers, the numbers can lie! The larger format oak used makes the new oak levels equivalent to 7.5% new oak or less in barriques. The percentage of new oak is one of a dozen factors that could make the wine appear in balance or overtly oaky. It’s much more important to taste the wine, assessing it for balance and harmony. Vineyard Location: La Morra sub-zone of Barolo – The wine is sourced from the two vineyards close to Brunate, San Francesco and Fontanazza.